Share the road | Be Nice. It was a beautiful day. Sunny sky, sixty degrees in the northeast in November. Gorgeous. I had woken up early and gotten so much work done. Just off to the store for a few odds and ends… dental floss, facial tissues, and shampoo. We parked our car, and should have sensed it then–the frenzy, the cars jetting through the parking lot. But we didn’t. No, we didn’t get run into while driving. (Had ya guessing though, didn’t I?) 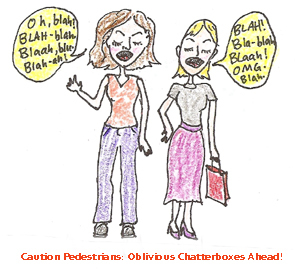 But as we walked to the store, two women approached on the same sidewalk. My husband and I naturally moved to single-file walking, and expected the other women to do the same. But they didn’t. They kept walking side by side. I was determined not to surrender the half of the sidewalk to which I was entitled. So I continued walking. But in the game of pedestrian “chicken,” I lost and got my goose cooked. My husband and I were rudely, mindlessly shoved onto the roadway, into traffic. Not cool. So for those of you who share the sidewalks like we share the roads (stay to the right, walk single-file with oncoming traffic), right on! And if you don’t, well, do try in the future. It’s an easy courtesy and one that takes almost no effort! This entry was posted in More ideas from Be Nice. and tagged Driving, pedestrian, playing chicken, rules by Jen. Bookmark the permalink. Pingback: Laws, law makers, and texting « Be Nice.